The Paris Peace Conference of 1946 was held between the months of July to October in Paris, France. Representatives from United States, Soviet Union. Great Britain, France and other allied powers discussed and agreed upon the provisions for the Paris Peace Treaties, which included monetary reparations, adjustments to territories, and political changes aimed at promoted democracy and peace. These treaties were signed in February 1947. 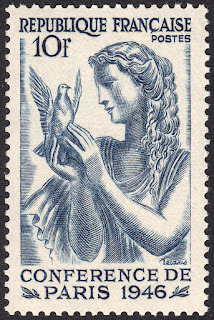 On 29 July 1946, France issued a set of two stamps in honour of this momentous event. The high value stamp of this set, the 10f, was designed and engraved by Albert Decaris. The imagery of this stamp is simple yet very effective. 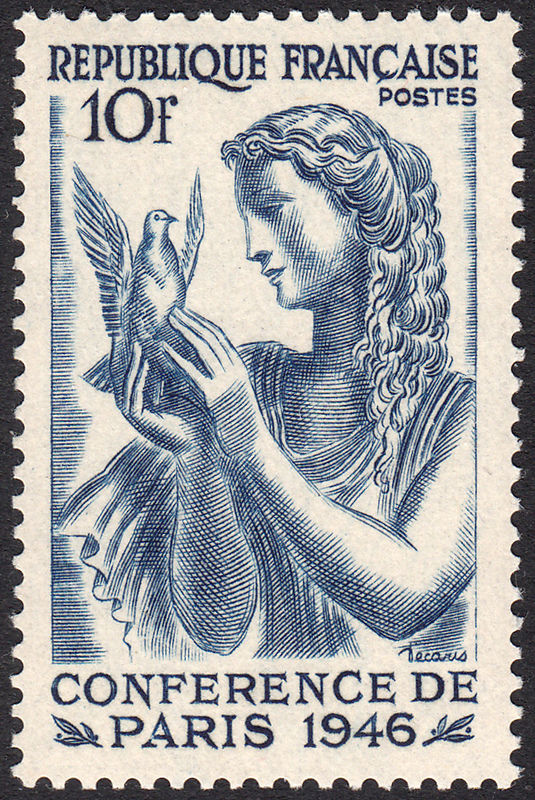 We have the dove representing peace at the point of being released, ready to fly the world over, promoting its credo.